We’ve just released a new Dashboard feature: Authorship Highlighting. This update to the Dashboard’s Article Viewer shows the current version of a live article, and now highlights which student added which parts of the text. To try it, just head to the Articles tab on your course page. In the list of Articles Edited, click any individual row to expand a drop-down menu revealing a row of buttons, then select the Current Version w/ Authorship Highlighting button. The Article Viewer will open, and at the bottom you’ll see a legend with student usernames. Once it finishes loading (which can take a while, depending on how old the article is) the text will be color-coded by student. Text with no highlighting was added by other editors. You can also move your mouse cursor over some text to pop up a tooltip with the name of the contributing student. Clicking on a row will expand it to display these buttons. Select “Current Version w/ Authorship Highlighting”. At the bottom of the Article Viewer, you’ll find a legend with the usernames of each student who edited the article. Once it finishes loading — this can take can a while for older articles — the article text will be color-coded by student. In this example, the 4 students working on the article contributed most of the text. The unadorned text came from other editors. 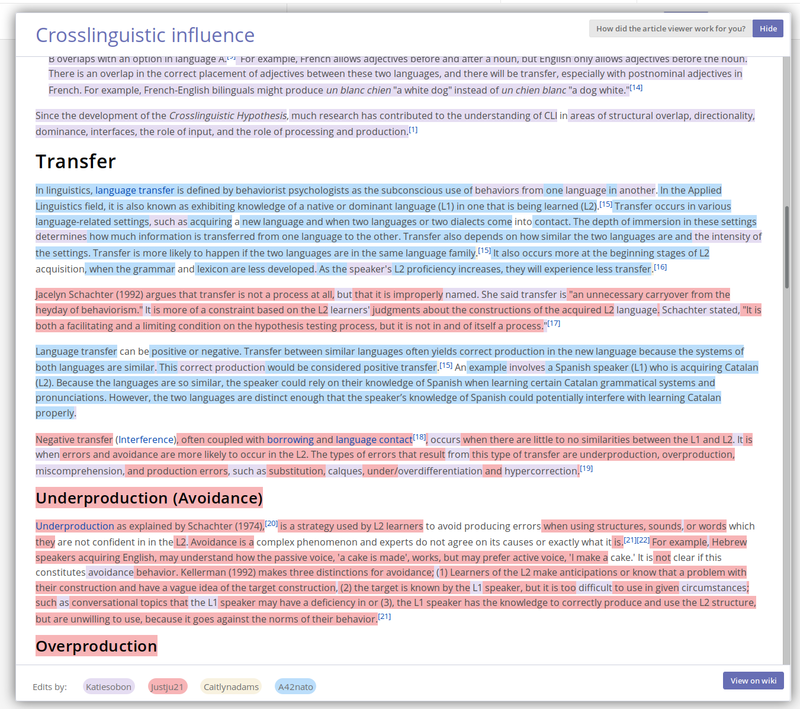 The Authorship Highlighting tool is aimed at making it easier to visualize and evaluate student work; better tools for evaluation and grading is the most common category of feature request from instructors. This update should be especially useful for evaluating group work — showing how each student in a group has “touched” a given article. 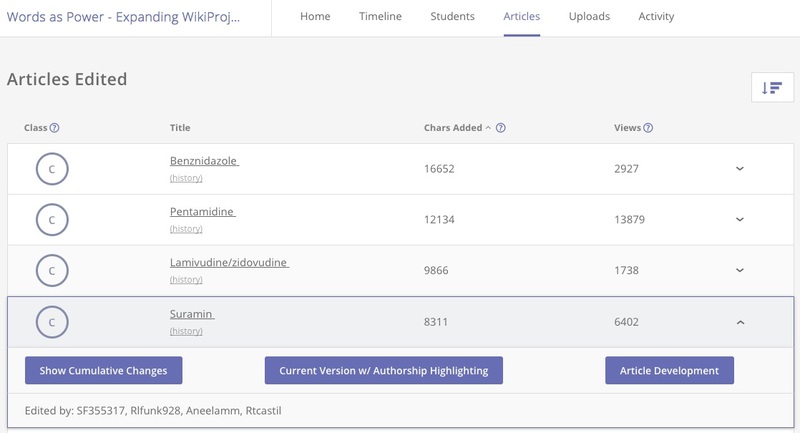 We’ve built Authorship Highlighting on top of a set of amazing data analysis and data visualization tools created by Felix Stadthaus, Maribel Acosta, and Fabian Flöck: wikiwho and whoCOLOR. It works by calculating which words in an article were added by which user and within which edit. I would like to find out more about this. How do I get the dashboard? Peter, you see it on the Articles tabs of course pages, either on the Wiki Ed Dashboard or (for English Wikipedia articles) on Programs & Events Dashboard.